A new thing has begun to enlighten us here at the Summit County Animal Shelter. A while back we decided not to eliminate any options when it came to trying to understand pets that were to be considered for placement in new homes. We all know how typical shelters use assessments, evaluations and such to determine who is eligible. Then we wait for the right person to show interest and in the meanwhile must resort to the kenneling, what training we have time for, foster homes, transfers or no-kill facilities that don’t provide the true bond of a home environment. All to hold off the life ending euthanasia process that we must perform time and time again. 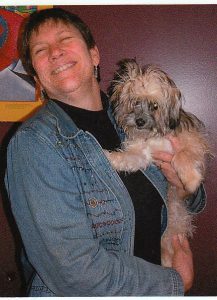 Most people are not open to embracing a nebulous concept such as communicating with pets through pet psychics. Our normal and typically human style of verbal commands or responses to our animals tends to prevail. When we first heard about this animal “telepathy” process at a local humane non-profit’s meeting in our community, it was fascinating, but not real practical to think of as an application in the shelter business. Then our first “visit” to Intuitive Advantage, Inc. occurred with a very skittish stray shepherd mix named Baron at a Doggie Days fair. I took him there to get accustomed to being around people and to have a better chance to become the adoptable dog we knew he could be. That first reading felt at like a hopeless effort. “Baron” was scared silly and was a basket case back at the kennel again. He was so full of fear and showed little trust in anyone, except the people who worked with him daily. Then the pair of “intuitive adventurers” came into the shelter for another appointment with “Baron”. We kept working with him from the basis that his behavior was a result of past events that he could let go of, and he finally confided through them that he truly wanted to go to a new home, and wanted to trust again. “Baron” was ultimately adopted by a big, tall man in September. His new owner and friends really love “Baron”. Just a few times since his adoption, “Baron” has shown his mistrust of people but he has never gotten out of control and is still getting better everyday. Since the first shelter pet recipient of Intuitive Advantage’s time, they have worked with about a dozen others animals. We ask for help with pets we are on the verge of determining unacceptable for placement. All of the animals Anne and Greg have helped with have gotten placed or are getting better and still trying. You cannot deny the process is strange, hard to wrap your mind around, but it’s working. And anything that makes a difference must be given some credence. They have been kind enough to provide their services to our shelter animals as a donation so far. The services they provide for animals generally are priced the same as their counseling work with humans. I am hopeful they will continue to drop in and let us know they have a little time for one more. It’s well worth the time and has done nothing but better the outcomes…. Especially, as someone said, “in the grand scheme of things, one life may not matter much…except to the one who lives that life”.